Oil’s beginning 2019 with the same price volatility that marked the end of last year, as uncertainty over crude output and the health of the global economy keep investors wary. Futures in New York slumped as much as 2.1 percent after rising 1.3 percent earlier in day, following a 1.8 percent gain over the final two trading sessions of 2018. Risk assets including stocks slid on Wednesday after data showed factory conditions across some of Asia’s most export-oriented economies slumped in December, hit by a trade war between the U.S. and China. Meanwhile, President Donald Trump signaled he wants to “ make a deal” to break a stalemate that’s had part of the government shut for 11 days in the U.S. — the world’s biggest economy. In OPEC member Libya, two oil ports were closed due to bad weather, slowing some output. Oil’s struggling to recover from a slump in the fourth quarter of 2018, which dragged crude in New York and London about 20 percent lower for the year in the first annual decline since 2015. Doubts still linger over whether pledged output curbs by OPEC and its allies will be enough to offset surging American supplies. Also, uncertainties over an ongoing trade spat between the U.S. and China are stoking fears about global economic growth and demand. “Sluggish economic data we see from China is again worrying investors but as weak economic signals have been somewhat expected, oil prices may gradually rebound after hitting the floor if OPEC producers actively trim output,” Ahn Yea Ha, a commodities analyst at Kiwoom Securities Co., said by phone from Seoul. West Texas Intermediate for February traded at $44.93 a barrel on the New York Mercantile Exchange, down 48 cents, at 7:50 a.m. in London. The contract rose to as high as $46 earlier in the session. Prices slid 25 percent to $45.41 in 2018. Total volume traded was about 62 percent above the 100-day average. 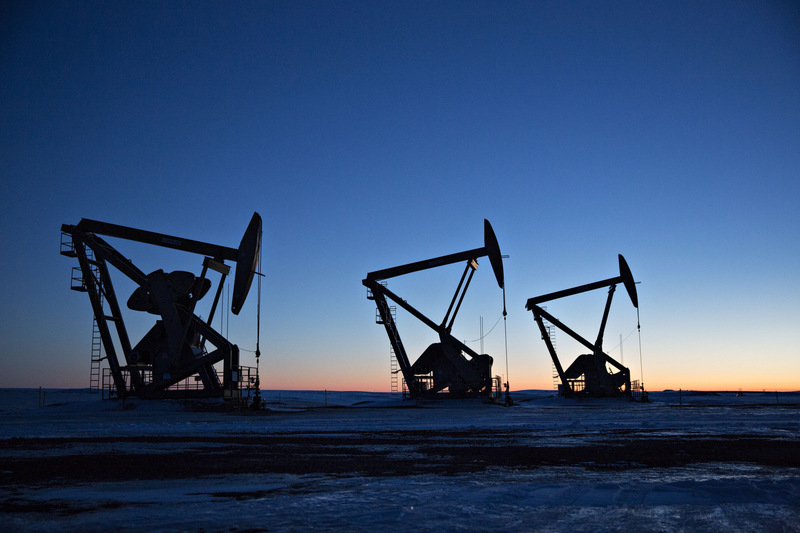 Brent for March settlement was 53 cents lower at $53.27 a barrel on the London-based ICE Futures Europe exchange. The global benchmark crude fell 20 percent to $53.80 in 2018. It traded at a premium of $8.02 to March WTI. “If the U.S. government shutdown ends, it would ease the downward pressure on oil as investor sentiment will improve,” said Kiwoom’s Ahn. In a separate tweet, the U.S. president said gasoline prices are low and are expected to fall this year. “Do you think it’s just luck that gas prices are so low, and falling? Low gas prices are like another Tax Cut!” he said in another post. In Libya, Waha oil production has been partially slowed down after the country’s Es Sider and Brega port terminals were closed due to bad weather. A total shutdown may be required if the situation doesn’t improve, the National Oil Corp. said in a statement. “While the supply disruption in Libya may not be too detrimental at this point, it is one of the elements that’s supporting oil prices,” Ahn said. Other oil-market news: U.S. light oil has become too cheap for Gulf Coast refiners to pass up. Fuel makers on the Gulf, home to the largest cluster of refineries in the world, processed oil with an average API gravity of 33.06 in October, according to the Energy Information Administration. Iran will invest about 15 billion rupees to expand a refinery run by Chennai Petroleum Corp. in south India, the company’s managing director said, amid U.S. sanctions on the Persian Gulf nation that have severely hit its oil exports.